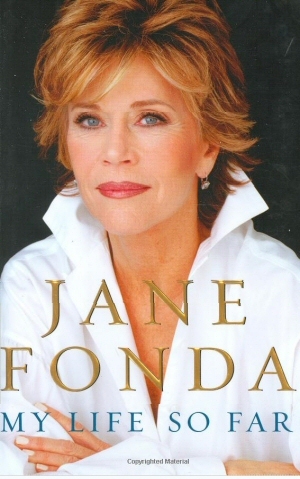 “Committing every ounce of everything I had to what I believed in.” Although Jane Fonda uses this phrase to describe her 1972 Indochina Peace Tour with Tom Hayden, it could very well be the theme of her life so far, and hence the theme of this beautiful, open-hearted, energetic and inspiring memoir. Act One (“Gathering”) deals with Fonda’s childhood, initial films, and relationships with her mentally unstable mother and emotionally distant father – relationships that set her up to marry three men who were allergic to intimacy: Roger Vadim, Tom Hayden, and Ted Turner. Amazingly, during that same Act Two, Fonda managed to win Academy Awards for her stunning performances in Klute and Coming Home and an Emmy Award for The Dollmaker. She also produced 24 home exercise videos and five best-selling books and was involved in several other important films, not to mention her constant concern for her children and the man in her life. Act Three (“Beginning”) shifts focus to an inner journey of learning to be her own person, learning to move at “soulspeed,” learning to inhabit her own body at last as she feels herself alive with Spirit. Not that she’s “just sittin’ and a rockin,” either: she has made a new film, sponsors an Adolescent Reproductive Health Center at Emory University School of Medicine, chairs the Georgia Campaign for Adolescent Pregnancy Prevention, and works tirelessly to overcome destructive gender stereotypes. There are many things to love about this memoir. I love the dozens of photographs that are scattered throughout the text and clearly labeled with names, locations, and (sometimes) dates. (Would that all of us had our photographs so carefully organized!) I love that Ms. Fonda manages to describe her successive partners’ strengths with loving admiration and their weaknesses without an ounce of vitriol. Same with her colleagues. The story of making On Golden Pond with Katherine Hepburn is priceless: Hepburn arrives at Squam Lake with her always-attentive companion, Phyllis Welbourn, and chooses for the two of them the eight-bedroom mansion Fonda had reserved for her own family and large retinue, leaving a cozy little cabin for the Fonda crowd. That detail brilliantly summarizes the Hepburn attitude, but Fonda’s tone is wry amusement rather than cattiness. She is in fact a master of tone on the page as well as on stage or celluloid. I also love that Fonda describes her own weaknesses unsparingly, yet without ever betraying herself. In this she exemplifies one of her quotations from Frederick Buechner: “To love ourselves means to extend to those various selves that we have been along the way the same degree of compassion and concern that we would extend to anyone else.” For example, while the world was admiring her body in films like Cat Ballou, Fonda was feeling so imperfect that she suffered from eating disorders (which persisted into her early 40s!). And while people were in awe of her glittering partnership with Ted Turner, she admits to still feeling that she had to please him at the expense of herself. Because of my investment in building an omnigender society, I love Fonda’s keen awareness of gender issues. She describes her youthful androgyny and her transgender sensations (“Perhaps I was a boy in a girl’s body”), fears that were alleviated by a kind gynecologist. She also understands that gender is a performance: for a while she felt that “I could do tomboy, but I didn’t know how to do girl.” Later, embarking on six years in France, “I would start down a new path -- as a female impersonator.” She admits to behaving like a chameleon in order to accommodate the interests of Vadim, Hayden, and Turner; and she charges that many lives have been lost in wars because of society’s misconstruction of masculinity, with male politicians fearing the labels of “soft” or “unmanly” should they support peaceful negotiations. “Arms and heart flung wide”: that sounds like the stance of a star responding to a curtain call as it becomes a sustained and roaring ovation. Brava, Ms. Fonda, bravissima!